Almost every Solo Mom has stood at the park watching a young father throw a football with his son or play catch with his daughter and yearned for what will never be. However, now that both of my children are teenagers, I take a great deal of pride in everything that I had the gift of being present for, especially things I was able to teach them. 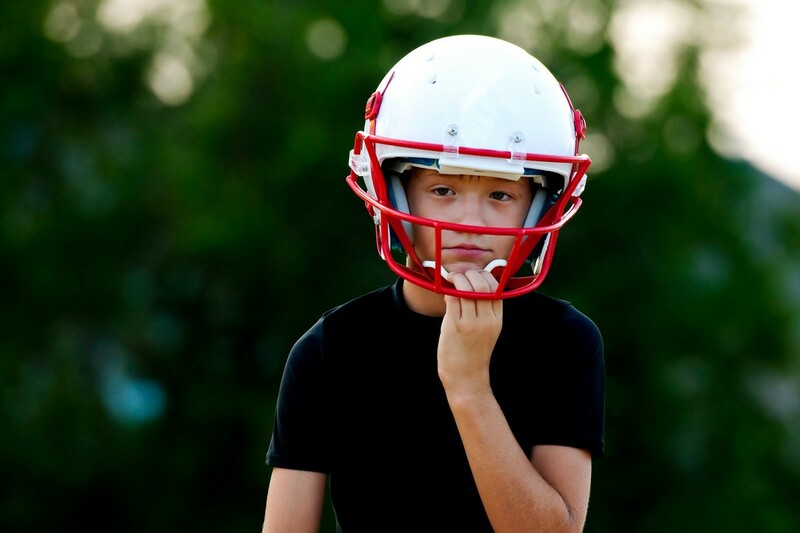 My son says, “You’re the one who taught me how to throw a perfect spiral, Mom,” and although I love to hear that now, it wasn’t always easy to figure out how to balance his fanatical interest in sports while cultivating it in a healthy way. Here I share his story to help other Solo Moms navigate similar tricky waters with their sons or daughters. Most of the toys my son received throughout his childhood remained in his toy box, untouched. Like a dystopian Toy Story, his wooden castle sat guarded by plastic knights on plastic steeds unable to defend anyone’s honor, remote-controlled helicopters mothballed before their virgin runs, many Lego pieces never self-actualized, and board games were stacked in a neat pile, unable to exercise their destiny. What he used, instead, was the real bow and arrow set from the thrift store, the football, the soccer ball, and a baseball mitt. Over time, football evolved as one of his lasting athletic passions. Many of my Solo Mom friends don’t know anything about football, much less how to play the game. Luckily, I’d grown up playing football with my five brothers, so I enjoyed it as much as my son did. I began by showing him how to curve his meaty mitts over the raised stitches on his Nerf ball, and he eventually perfected his spiral with a junior-sized leather ball. Fall evenings, after supper, we’d retire to the front yard, playing catch until the Montana twilight slipped into darkness. Without realizing it (my nostalgia for my own childhood combined with a desire to overcompensate for an absent father), I may have been encouraging and promoting his interest in football to an unhealthy level. Even though, over time, my son’s athletic interests did expand to include soccer and hockey, football remained his real passion. It was all he could talk about, think about, and imagine playing into his future. Our next-door neighbor’s son played for the high school football team and wanted to play for the Montana Grizzlies in college. My son idolized him and had an autographed picture of the team hanging proudly next to his bed. He’d even begun to tell me how one day, when he played pro, he was going to buy me a home and that Porsche 911 I’d always wanted. As Solo Moms, we have to always be aware of how our need to compensate for what we feel is missing in our children’s lives may inadvertently point them in an unanticipated direction or influence them in an unintended way. I’m not sure how much I influenced my son’s interest and dogged pursuit of the sport, but in the clear light of hindsight, I suspect my interest in the game had a great deal to do with it. Sometimes time gives us hindsight; other times, it suddenly lands uncomfortably in our lap as a result of an unexpected experience. For me, it was the latter. Every Solo Mom can attest to the fears, rational or irrational, that haunt our subconscious regarding our children’s livelihood. For me, those fears were realized the day my son fell from a tree fort and I spent two hours in an ambulance supporting his head while he was strapped to a gurney. It took that incident to put sports into perspective. Miraculously, his spinal cord was not injured, but he had compressed some vertebrae in his neck. A couple of months in a neck brace, and he was healed enough to pursue athletics again. The realization of how fragile my son’s body is and that he could have been paralyzed suddenly made me stop and assess my own level of participation, encouragement, and interest in football and to try to begin to take it down a notch. All this made it incredibly tricky to determine how to counsel my son when he entered fifth grade and could finally play football. Protectively, I wanted to say absolutely not, but I also didn’t want him to have any regrets or blame me later for a lost opportunity. I also believed that the chance of injury would be less at that level versus what he would face in junior or senior high school. After getting the “all clear” from his doctors, I let him make the decision. Not surprisingly, he chose to play. I can now say that I handled that scenario just right for us. He came out of it realizing he wasn’t big enough, he didn’t like getting yelled at, and he definitely didn’t like getting hit. Since then, he has focused almost entirely on soccer—a sport that also has risks but one that he enjoys much more and is better suited to his physique and personality. I’m sure that my son hasn’t completely put his football dreams to rest, though. As he enters junior high this coming fall, I fully anticipate that he will consider playing once again. I’ll still look forward to fall and football, but the lesson I learned is one that would be prudent for all Solo Mom’s to remember: your passion for a sport, and your desire to make up for an absentee father, can greatly influence your child’s athletic interests, either positively or negatively. A fourth-generation Montanan, Andre Zollars is a former U.S. army major who has also held management positions in marketing with MCI and the Sacramento Bee. She now resides in Lewistown, Montana, with her husband, four kids, three dogs, a cat, and a horse. Andre has published in print and online publications, including USA Today Travel, Yahoo! News, Livestrong.com, Big Sky Journal, and more. You can connect with her on Twitter and LinkedIn.